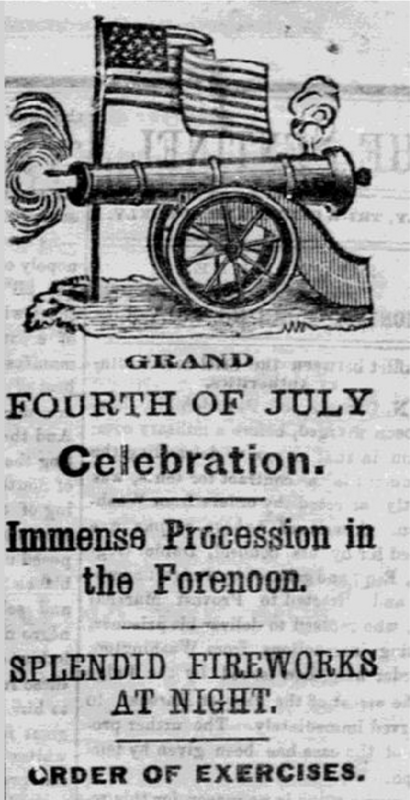 How Did People Celebrate Independence Day During the Civil War Era? These days, the fourth of July is like one big birthday party for the country. But in the Civil War years, it had a very different feel in a nation that seemed to be falling apart. Now a crowdsourcing project by Virginia Tech is getting a closer look than ever before at how people felt about the holiday during that perilous time; And they’re doing it with the help of a small army of volunteer - citizen researchers. Sometimes a national holiday is just a day off. But in trying times, it can become a focal point for political and personal expression. Paul Quigley is director of the Virginia Center for Civil War Studies at Virginia Tech. "You know, If you think about in your own life, how often do you articulate what it means to be an American or a Virginian or something like that. It doesn’t happen all that often, but in times of crisis, like the civil war and especially national holidays, like the 4th of July, that’s when a wider range of people give voice to those attitudes than is usually the case." But most of their speeches, news articles, letters and diaries from back then are locked away in archives, available only to historians and experts. So Quigley and a team of educators marshaled the forces of interested amateur historians to help raise those long quiet voices. The project is called Mapping the Fourth of July; Exploring Independence Day in the Civil War Era. It kicked off last year on that day and already, it’s grown into an online community, a brigade of Civil War sleuths, lead by Computer Scientist Kurt Luther. So like modern day monks. volunteers copy out each document s by hand -- well typing by hand anyway -- and they tag them, so computers can easily find them. That’s why the human touch is so important here. Because each volunteer is asked to make decisions about what’s germain, where an item fits in the larger story. And while trained historians may know more of the answers, it’s the volunteers who often have new questions, that take the project into new territory, says Paul Quigley. “And of course, most professionals, historians included, think we’re the only ones who can do what we do and that you need to be an advanced expert in order to do a really good job with historical research. One of the things I like about this project is that it allows us to think about; What a high school student who maybe isn’t very interested in history, how would they read primary sources differently? What would they contribute or what would a retired person, who has always been interested in Civil War history, but has never done anything professional, maybe doesn’t normally read primary sources, what can they bring?" Quigley says there’s still lots of original material out there yet to be discovered on how people all over the country felt about celebrating the Fourth of July during the Civil War era. Volunteers are invited to join in primary source mapping project from where ever they are. Wednesday June 28, 2017, 4:00 – 5:00 p.m. Mapping the Fourth Exhibit Reception. A free reception showcasing an exhibit on “Mapping the Fourth of July,” a crowdsourced online archive of primary sources that reveals how Americans of the Civil War era celebrated Independence Day. Virginia Tech’s Newman Library, Alumni Mall and Stanger Street, near the 2nd floor circulation desk. Friday June 30, 2017, 3:00 – 5:00 p.m. Fourth of July “Transcribeathon.” Heard about our “Mapping the Fourth of July” website and want to check it out yourself? Getting ready for this year’s July 4 holiday and curious about how Americans celebrated their national anniversary during the Civil War era, when their nation was falling apart? Stop by Blacksburg Public Library any time between 3 and 5 p.m. to chat with the project team and try your hand at transcribing, tagging, and more. Computers and expert guidance will be provided. Blacksburg Public Library is at 200 Miller Street, Blacksburg VA 24060. And you can keep up with Mapping the Fourth of July on Twitter and Facebook. It may seem like an invasion of privacy to read someone’s diary, but for historians they are treasure troves. Because they’re not written for public consumption, like a memoir or a letter, they open a window into the deepest thoughts of the writer. The Historic Fredericksburg Foundation has organized a lecture series featuring the diaries of three women who lived in there during the American Civil War begins this week. While most of this state’s gardening gets done in the spring and summer, Virginia’s tree lovers have been busy this fall. Sandy Hausman reports on an effort to plant 620,000 – one for each man who died in the Civil War. This is how a friendship started. Paige Chargois was picking up her newspaper at the Independent Living community where she lives in Richmond. That’s when she met a woman who appeared to be lost. The woman was a new neighbor, and she needed to get to a bank to cash a check.